If you would like to study at an English-speaking university, work in the UK or need to have a certificate to prove your English level, our exam preparation will help you to work towards your exam. Our Exam Preparation Courses are designed to prepare you for your language exam by improving the four skill areas of listening, speaking, reading and writing, as well as introducing and practising exam techniques. 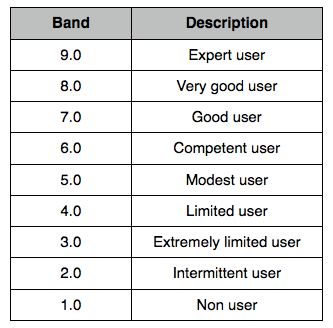 With an understanding and regular feedback of your strengths and weaknesses, you will be advised where to concentrate. While improving your English skills, you will also gain strategies for approaching each part of the test. The course uses tailored materials as well as past papers in order to prepare you for the exam. 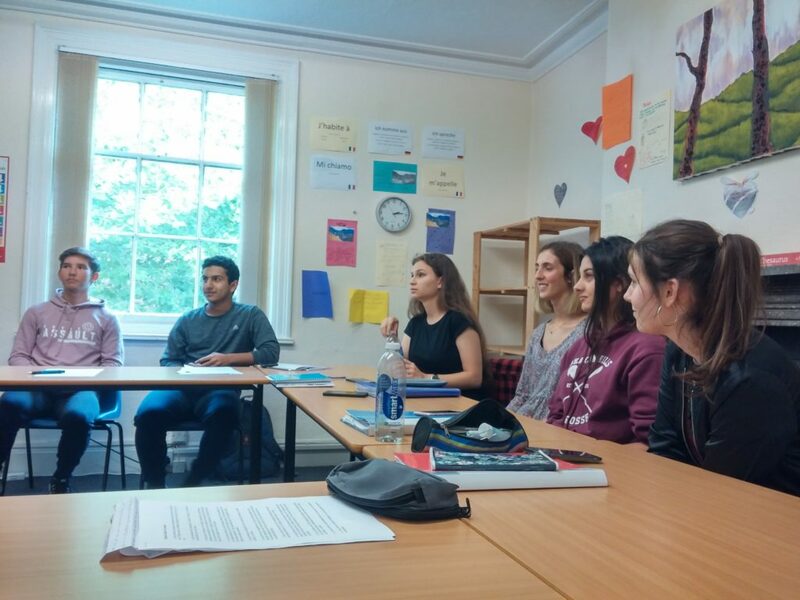 In the main we offer exam preparation courses that work towards the IELTS examinations, the Cambridge examinations and the Trinity SELT. Find out more about the examinations below. The International English Language Testing System (IELTS) is one of the world’s most popular English language proficiency tests for higher education and global migration, with more than 2 million tests taken last year. IELTS evaluates all of your English skills (reading, writing, listening and speaking) and is designed to reflect real-life use of English – at study, at work. IELTS has a strong international reputation, and is accepted by over 8,000 organisations worldwide, including schools, universities, employers, immigration authorities and professional bodies. The General Training module focuses on basic survival skills in a broader social and educational setting. General Training is suitable if you migrate or if are joining a training programme or doing work experience in English speaking countries. It is not designed for degree level. The Cambridge exams are recognised around the world. by thousands of employers, universities and government ministries as proof of ability to use English. Success in a Cambridge English Qualification provides you with an internationally recognised certificate showing the level you have attained in English. Our exams are based on real-life situations, helping you develop the skills you need to communicate effectively. 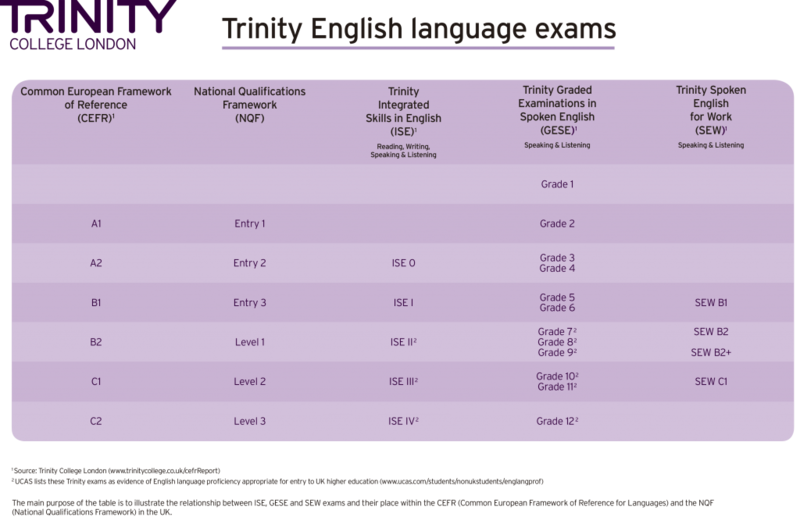 Trinity provides Secure English Language Tests (SELTs) across the UK, which are recognised by universities across the UK and approved by the UKVI for visas. The Graded Examinations in Spoken English (GESE) are oral assessments reflecting real-life exchanges. The GESE 3 is approved by the UKVI as a Secure English Language Test (SELT) for the A2 Further Leave to Remain visa extension in order to further remain in the UK n the five year partner or parent route of settlement. The Integrated Skills in English (ISE) tests the four language skills, reading, writing, listening and speaking and reflects a real-life usage of English. 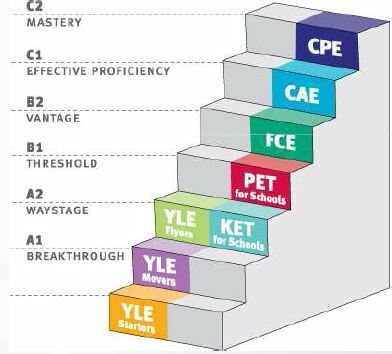 The exam can be taken on the levels A2- C1 by young people or adults in order to prepare them for higher education. This exam is accepted by the UKVI as evidence of English language proficieny test required for Tier 4 student visa applications as well as recognised by univerities.